Current agricultural interventions will only deliver 21-40% of target, indicating need for transformative technical and policy options. Wollenberg E, Richards M, Smith P, Havlík P, Obersteiner M, Tubiello FN, Herold M, Gerber P, Carter S, Reisinger A, van Vuuren D, Dickie A, Neufeldt H, Sander BO, Wassman R, Sommer R, Amonette JE, Falcucci A, Herrero M, Opio C, Roman-Cuesta RM, Stehfest E, Westhoek H, Ortiz-Monasterio I, Sapkota T, Rufino MC, Thornton PK, Verchot L, West PC, Soussana JF, Baedeker T, Sadler M, Vermeulen S, Campbell BM. 2016. Reducing emissions from agriculture to meet the 2°C target. The Paris Agreement, signed in 2016 by 177 countries and counting, indicates a global commitment to limiting climate change to 2°C. In parallel to the Paris Agreement, countries submitted 162 climate change adaptation and mitigation plans to the United Nations. Three-quarters of plans included intentions to reduce emissions in the agriculture sector. Translating national plans to global impacts on climate change is not possible without clear and measureable targets for emissions reductions. In response to this gap, the CGIAR Research Program on Climate Change, Agriculture and Food Security (CCAFS), with 21 partners, put forward a preliminary target for agriculture, published in the journal Global Change Biology in May 2016. To calculate the amount of global emissions reductions in agriculture necessary to meet the 2°C limit, leading climate change and agriculture scientists employed the 2°C scenario from the Intergovernmental Panel on Climate Change (IPCC) and three integrated assessment models. The anaysis focused on methane and nitrous oxide emissions from agriculture, given expected increases in food prodution to meet the needs of a growing population and assuming steep emissions cuts in the energy, industry and transportation sectors. 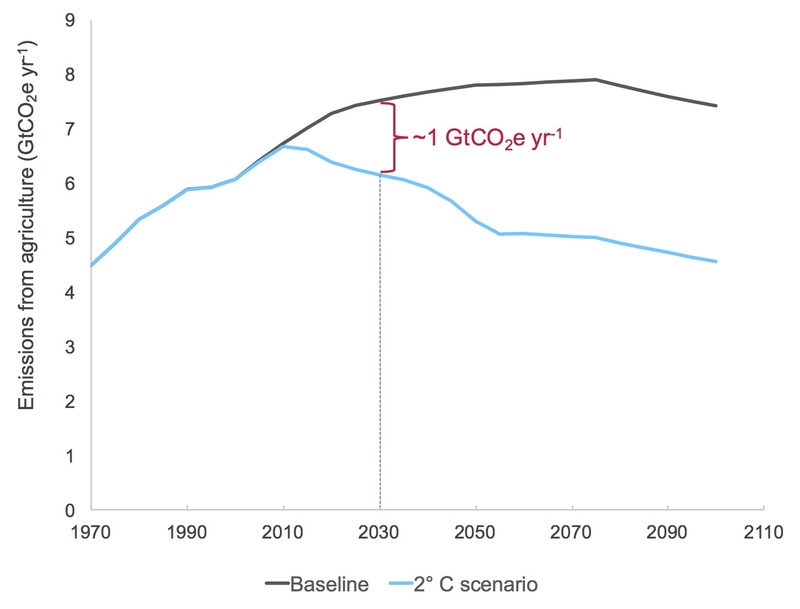 In the article, scientists proposed that annual emissions reductions from agriculture by 2030 must reach 1 gigatonne of carbon dioxide equivalents (GtCO2e/yr) to stay within the 2°C limit. Emissions reductions would would need to increase in the longer-term. The figure below shows estimated business-as-usual emissions from agriculture in the top line, and the maximum amount of emissions from agriculture in a 2°C world in the bottom line. The gap - 1 GtCO2e/yr - is the proposed mitigation target for agriculture. Linking the target to a meaningful global policy goal will provide a reference point for assessing contributions to the global mitigation needed. Identifying a goal for the agriculture sector can then show whether mitigation plans are on track. Our next task is to quantify the agricultural emissions budget needed to reach the 1.5°C limit, and then test and identify alternative policy options that will get us there. 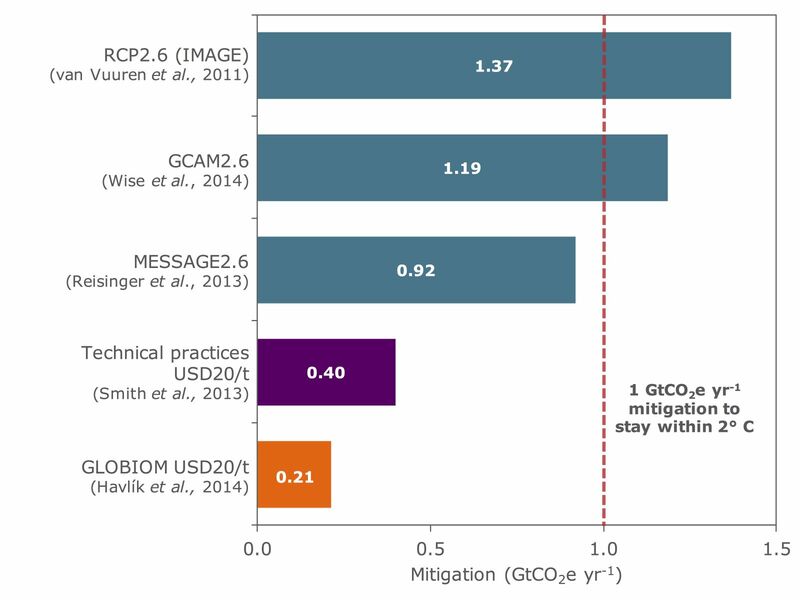 Having calculated the 2°C target, authors then estimated how much known agricultural interventions can contribute to emissions reductions. Assuming steady or increasing food productivity, the authors calculated two pathways: 1) a technology-by-technology estimate of mitigation potentials, including climate-smart livestock, cropland management, and paddy rice management, and 2) modeled intensification in livestock and crop production, including structural transformations in the livestock sector. Groundbreaking new research in emissions from fertilizers is already providing guidance about how we can improve crompland management to increase agricultural production without similar increases in emissions. Coordinated research and investment in promising technical options, such as methane inhibitiors and low-methane breeds in the livetock sector and nitrogen inhibitors for major annual crops. Innovative policies and standards that increase ambition for reduced emissions. These include low emissions development financing and government or supply chain support for farmers to meet sustainability standards. Support for farmers' capacity to use new practices, including finance, incentives, and technical assistance. Further research is needed on reducing emissions throughout the food system, including: sequestering soil carbon, increasing agroforestry and avoiding deforestation, decreasing food loss & waste and shifting dietary patterns. Significant mitigation in the land sector is possible through carbon sequestration in biomass and soils from reduced deforestation and forest degradation. But mitigation in the land sector should be pursued hand-in-hand with productivity gains and improved land management techniques on agricultural lands for agricultural and rural development and increased food security. Countries can participate in trainings and use available agriculture and land use data to support evidence-based decision-making to identify viable mitigation options in the agriculture and land sectors, and their linkages with sustainable rural development. With an aspirational mitigation target for agriculture set, the global community and individual countries can look beyond what is most technically or politically expedient to the emissions reductions they must achieve together to limit climate change to 2°C. Funders: This research is carried out with support from CGIAR Fund Donors and through bilateral funding agreements. The authors gratefully acknowledge funding from: Australia (ACIAR); Denmark (DANIDA); Ireland (Irish Aid); Netherlands (Ministry of Foreign Affairs); New Zealand Ministry of Foreign Affairs &Trade; Portugal (IICT); Russia (Ministry of Finance); Switzerland (SDC); The UK Government (UK Aid); The European Union (EU); The Program is carried out with technical support from The International Fund for Agricultural Development (IFAD).